An unaltered photocopy of your DD-214, WD AGO, NAVPERS, NG or other military issued document clearly displaying your award of the ARMY SEA DUTY. 1. Description: The ribbon is 1 3/8 inches in width. It is composed of the following vertical stripes: 3/32 inch Navy Blue 67179, 5/32 inch Scarlet 67111, 5/32 inch Old Gold 67105, 3/32 inch Teal Blue 67121, 1/8 inch Grotto Blue 67165, 3/64 inch Soldier Red 67157, 1/32 inch Old Gold 67105, 3/64 inch Soldier Red 67157, 1/8 inch Grotto Blue 67165, 3/32 inch Teal Blue 67121, 5/32 inch Old Gold 67105, 5/32 inch Scarlet 67111, and 3/32 inch Navy Blue 67179. 2. Components: Ribbon. MIL-D-11589/603. (There is no medal for this ribbon). a. For Active Duty members: Active duty members must complete two years of cumulative sea duty on a Class A or B USAV or for duty aboard other qualifying vessels when such vessels meet the requirements of AR 600-88, paragraph 1-7 to be awarded the ASDR. Subsequent awards are authorized upon completion of additional two years of cumulative sea duty. b. For ARNG and USAR members: Members of the ARNG and USAR must have two creditable years in a U.S. Army watercraft unit, which must include a minimum of 25 days underway during each year and two annual training exercises underway on a Class A or B USAV or a 90-day deployment aboard a USAV, underway. Subsequent awards are authorized upon completion of additional qualifying periods of sea duty. c. For mobilized soldiers: One year of sea duty as a mobilized soldier will be credited toward one creditable year as long as the minimum underway requirement is met. d. For members of other Services: Members of other services are authorized to be awarded the ASDR as outlined in paragraphs a and b above, consistent with their respective Service policies and concurrence, in accordance with AR 600-8-22, paragraph 1-36.
e. Posthumous Award. For the first award only, an individual may be posthumously awarded the ASDR prior to completion of service criteria as defined above, provided the members death is ruled as in the line of duty. f. Award approval authority. 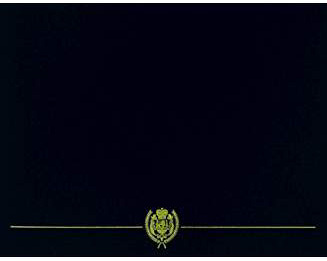 The Chief, Marine Qualification Division, is the approval authority for award of the ASDR to eligible Service members. Eligible members or their next of kin may submit requests for the ASDR to the Chief, Marine Qualification Division, Attention: Career Pay Office, HRC, Building 705, Room 231, 705 Read Street, Fort Eustis, VA 23604-5407.
g. Retroactive Award. The ASDR may be awarded retroactively to those personnel who were credited with service as defined above, after 1 August 1952, the activation date of the first heavy boat company in the Transportation Corps. Eligible members or their next of kin may submit requests for the ASDR to the Chief, Marine Qualification Division at the address given in paragraph 3f above. Requests should include the individuals full name, social security number or serial number, dates of service, DD Form 214 (if applicable), and information concerning the individuals sea service duty. 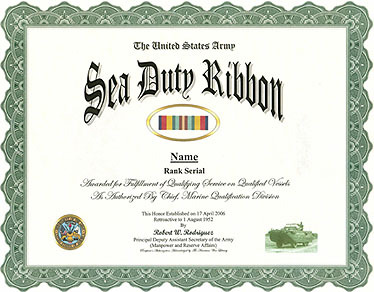 (1) The ribbon is awarded after 2 years of sea duty service. (2) Second award is equivalent to 4 years of service and one bronze service star is worn on the ribbon. (3) Third award is equivalent to 6 years of service and two bronze service stars are worn on the ribbon. (4) Fourth award is equivalent to 8 years of service and three bronze service stars are worn on the ribbon. (5) Fifth award is equivalent to 10 years of service and four bronze service stars are worn on the ribbon. (6) Sixth award is equivalent to 12 years of service and one silver service star is worn on the ribbon. (7) Seventh award is equivalent to 14 years of service and one silver service star and one bronze service star are worn on the ribbon. (8) Eighth award is equivalent to 16 years of service and one silver service star and two bronze service stars are worn on the ribbon. (9) Ninth award is equivalent to 18 years of service and one silver service star and three bronze service stars are worn on the ribbon. (10) Tenth award and final award is equivalent to 20 years of service and one gold star is worn on the ribbon (Note: The U.S. Army adopted the Navys gold star and it can be purchased through local supply). 4. Background: a. On 17 April 2006, the Principal Deputy Assistant Secretary of the Army (Manpower and Reserve Affairs) approved the establishment of the ASDR. It is awarded to members of the Active Army, Army National Guard (ARNG), and United States Army Reserve (USAR) for completion of designated periods of sea duty abroad Class A and Class B United States Army Vessels (USAV) as defined in AR 56-9, Table 1-1. The ADSR is also authorized to be awarded for duty aboard qualifying vessels when the vessels meet the requirements of AR 600-88, paragraph 1-7.
b. Permanent orders will not be issued to announce award of the ASDR. c. In order of precedence the ASDR will be worn after the Military Outstanding Volunteer Service Medal.